Institutions are using predictive analytics for a wide variety of operations — strategic enrollment management, early-alert systems, recommender systems and adaptive technologies, to name a few. Using sophisticated data systems can be beneficial for understanding students and guiding them through college, but with these powerful tools come a few pitfalls, for both the student and the institution. Therefore, institutions should understand the purposes of using predictive analytics, as well as the unintended consequences, like human biases and unethical usages of data. 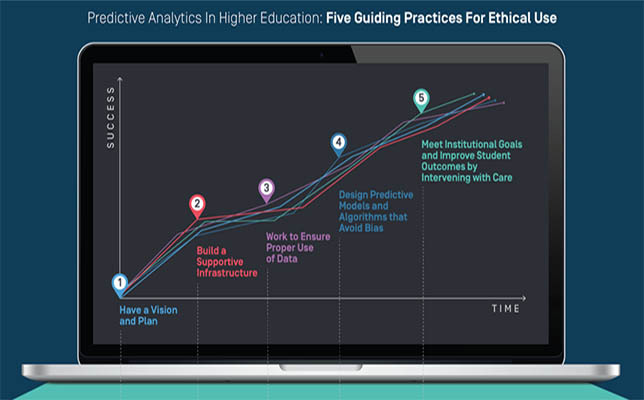 Those findings and more can be found in a new report from New America, a nonprofit, nonpartisan think tank and civic enterprise based in Washington, D.C. “Predictive Analytics in Higher Education,” written by policy analysts Manuela Ekowo and Iris Palmer, outlines five guiding practices to ethically use predictive analytics. The Hechinger Report reported that the information was released this week at SXSWedu in Austin. The first guiding practice is to have a vision and a plan for data use that will help drive the direction of a predictive analytics effort. Without a clear plan, predictive analytics could be used in ways that do more harm than good. The think tank recommends meeting with key staff and stakeholders before making important decisions to ensure everyone is on the same page. It is crucial to question the purpose of introducing predictive analytics, as well as consider the negative consequences. The plan should also list measurable outcomes that the institution hopes to achieve. Because predictive analytics can be used to create change almost immediately, the second practice involves building a supportive infrastructure that ensures the benefits are not only understood, but welcomed by campus stakeholders. Therefore, it is crucial to bring on the head of communications and marketing to augment outreach efforts and clearly articulate how using predictive analytics can benefit the institution. “Experts in information technology, student data laws and staff with experience drafting contracts with vendors” should also be on board, according to the report. Working to ensure proper use of data is the third on the list. “To build and use these tools ethically, institutions must consider the quality of data and data interpretation, as well as issues around privacy and security,” said the report. Ekowo and Palmer recommend communicating with students, staff and anyone else whose data is being collected, letting them know their rights and obtaining consent. Furthermore, IT and other staff should be routinely trained on how to keep sensitive records secure. Step four is to design predictive analytics models and algorithms that avoid bias. The Pew Research Center recently released a report that listed human biases as a top concern with using algorithmic systems, since big data doesn’t always represent everyone. The report authors echo this sentiment and caution against designing algorithms that pigeonhole any one group (race, ethnicity, socioeconomic status, etc.). Predictive models should be tested for accuracy and alignment to campus goals either internally or by an external evaluator. If an institution goes with the latter, it is imperative to work with vendors that are sound, transparent and free from bias as much as possible. The fifth and final guiding practice is to meet institutional goals and improve student outcomes by intervening with care. “How your institution acts as a result of what it learns from predictive analytics is where the rubber meets the road,” according to the report. Therefore, it is important to deliver interventions in the context of other supports offered at the institution. Staff should be trained on how to appropriately deploy interventions, craft messages and ensure interventions are accessible to target populations. Lastly, it doesn’t hurt to train students to use their own data to guide their experiences on campus. To learn more, the full report is available on the New America site.